I love avocados. Those three little words seem like the biggest understatement for how I truly feel about this delicious, green, buttery fruit. I love anything and everything about them. 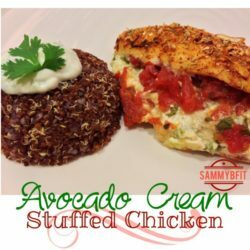 Whether they are baked in cookies or cakes, served with cottage cheese, on a salad, or maybe even in stuffed into a chicken breast? And what’s not to love about them? They are jam packed full of nutrients – mainly healthy monounsaturated fat (healthy fats!) and fiber. Tonight I decided to stuff chicken breasts (because who doesn’t love stuffed chicken breast??) with an avocado tomato cream sauce. And… it … was… delightful! Give it a try, avo-fan! And if you’re new to avocados, I bet you’re a fan once you try this dish! Preheat the oven to 375 degrees F. Spray an 8 x 8 baking dish with nonstick cooking spray. Slice the edges of each chicken breast and fold open. In a mixing bowl, combine all seasonings for the chicken and stir well. Rub the seasonings onto the tops of the chicken breasts. In a separate mixing bowl combine all ingredients for the cream sauce. Be sure to mash the avocado thoroughly. Divide the cream sauce into the inside of each chicken breast. Add 1 tbsp. of tomatoes to the top of each cream sauce, followed by the garlic powder and oregano. Fold the chicken breast over and close with a toothpick. Season the top with Mrs. Dash Chicken seasoning and place into the oven for 30-40 minutes.Time will be dependent on the thickness of the chicken breast. Watch it at 30 minutes. Remove from oven and enjoy! Hey! I was just wondering how well this re-heats! I can’t say that I have ever reheated this item. Being that it’s avocado- and avocado tends to brown rather quickly, I can’t say it would. Once an avocado starts to oxidize (brown), it looses its taste. I would, however, recommend squirting lemon or lime juice over the top of each. The acidity of lemon/lime juice helps to significantly reduce the browning of avocados, thus retaining their flavor! I am sorry I couldn’t be much of help on your question! Hope it helped!